In his seminal work Wild At Heart, John Eldredge explored the idea that because men are made in the image of God, they are dangerous, adventurous, passionate and — well — wild, because those characteristics are true of God Himself. Eldredge has continued to build his movement among men on the premise that the heart of a regenerate man in Christ is good and free, even noble. There have been many forces, both within and without the church, which have altered that understanding of what a man is, but Eldredge has maintained that a true, unvarnished look at what God made when He created men reveals the inherent goodness of being wild at heart. 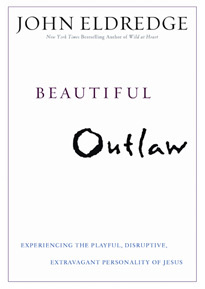 Now, 10 years on, Eldredge has turned his attention intently upon Jesus in his new book Beautiful Outlaw. This book does for our understanding of Jesus what Wild At Heart did for our perspective on men. Eldredge, a skilled communicator if ever there was one, pulls back the veil of religiosity that often gets thrown over Jesus and shows Him as the person He was and is. Fully God, yes. However, fully God without being a hyper-spiritual doctrinal tyrant, which is the way many religious people have portrayed Him. Rather, Jesus, in His divinity, is actually the least religious person you will ever meet. Jesus is approachable. He is human. He is, as Eldredge says at one point in the book, more human than humanity. We can relate to Jesus because of His humanity. He is fully human without His divinity being undiminished. Eldredge does not promote that version of Jesus, popular in some circles, where Jesus is portrayed as so laid back and chilled out that He would never confront anybody. Instead, Eldredge makes Jesus as real to us as He intended Himself to be. Jesus suffered as we suffered. He understands us in a way that no one else ever will, or could. And He loves us with fierce intentionality. Beautiful Outlaw is Eldredge’s attempt to change that understanding of Jesus by showing Him as He was and is: playful, disruptive, extravagant, fierce, cunning, scandalously free, humble and honest. Eldredge believes the most essential thing in life is to get our vision of Jesus back from those who have twisted it or hijacked it through the years. “Very dry…two-dimensional…undecipherable,” describe the way so many people see Jesus. And that includes Christians, the very ones who should know Him intimately. The travesty of our current age is that distortions of Jesus are both within and without the community of people who identify themselves as followers of Jesus. Beautiful Outlaw has come to steal us away from all misrepresentations of Jesus. Like Jesus Himself, some will find it scandalous, but this book is indeed beautiful, and it inspires deep, deep love of Jesus.